If there was ever one of my stories that you should read, this would be it. I always say that every sale is not always sunshine and rainbows, this sale was a roller coaster, the highs were high, and the lows were low. Debbie is the mother of one of my friends. We met one day in the late spring last year to discuss the sale of her home. We had all the usual conversations, and got the home ready for market. Heather Styles Homes came in and gave some recommendations, and Debbie went above and beyond to ensure that everything was done. From decluttering, moving furniture, painting, redoing the roof, and renovating the bathroom, the house underwent an incredible transformation by the time Debbie was done. We hit the market knowing it was going to be a long journey, and to our surprise on day 7 we received an offer. 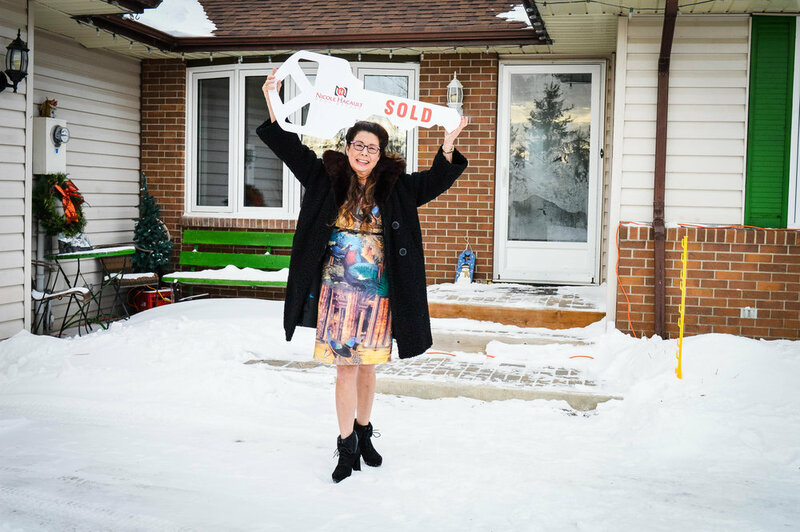 We were ecstatic at the fact that we were breaking records in the neighbourhood, and thrilled at the price we got for the home. Only problem was this offer was contingent on the buyers home selling, which was in the city. We thought this would be no big deal at all, but as days turned into months we realized we needed to forget about this offer and move forward searching for a new buyer. We found that buyer a few months later, and a few months after that again. Both offers ended up not going through due to reasons out of our control. As the winter months were upon us, we prepped ourselves for having to wait till the spring. There were several times Debbie was ready to take the home off the market. She had been through 95 showings (or more) and was exhausted. I can't even imagine having to leave my home that many times for showings and constantly living in a home that was "show ready", but Debbie did it. I was thrilled when a couple days into the new year, the showing requests started coming in again, and I received word that we were getting another offer. By this time we knew better than to get excited, and we all held our breath waiting patiently as each condition became satisfied. I text Debbie "Call me please" when I finally received the documents I needed to finalize the sale. On the other end of the phone I could hear how nervous she was. Was this call going to be like the 3 other calls before where I delivered the news that another offer had fallen apart? No, this was the call where I was jumping up and down in my own home and was FINALLY able to say that the home is SOLD!!!!! Debbie, I have had some difficult sales, but none have ever been such an emotional roller coaster. You endured far more than anyone else I have ever worked with, and I thank you for being so strong and sticking by my side as we went through this together. Through al this you have remained so incredibly positive, and your bubbly personality has always shone through. Thank you for being so amazing and trusting me through all this.